With all the ingredients of traditional Pumpkin Pie, this dessert is a new twist. We start our bottom layer with grated dark chocolate (a nice surprise when you get there). 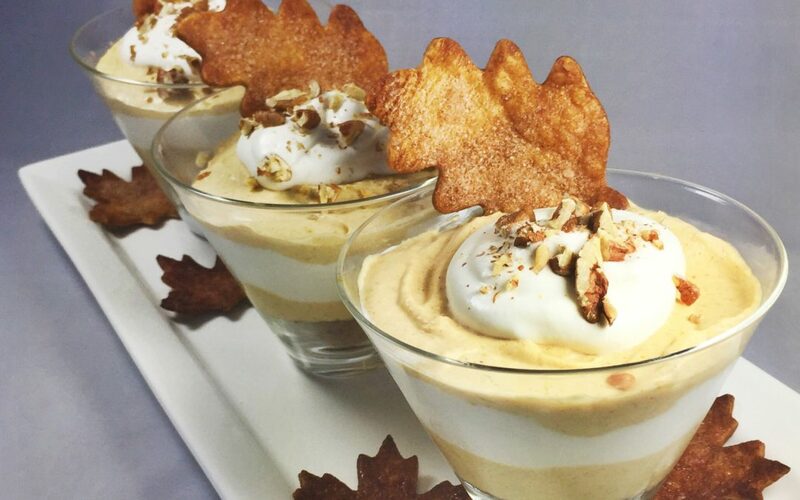 More deliciousness is added with our layered Bourbon-Pumpkin Mousse and Whipped Cream. The top is embellished with a sprinkling of toasted pecans and a cinnamon-sugar coated piecrust leaf – perfect for dipping in the dessert. To get a nice brown color on our piecrust leaves, we brushed a little cream before sprinkling with cinnamon and sugar. Using the left over piecrust, we cut out extra leaves for dipping and decorating the serving platter. If you want to add a little more bourbon-kick, we give you the option to add it to your whipped cream. Preheat the oven to 425 degrees. Roll out the pie dough to 1/8″ thick on a lightly floured surface. Cut out leaf shapes and place on a parchment lined sheet tray. Mix the sugar and cinnamon in a small bowl then brush the leaves with the cream. Sprinkle with the cinnamon and sugar to cover the pie dough shapes. Bake for 12 minutes. Cool completely. Wrap tightly or store in an airtight container if using the next day. Fill a large bowl halfway with ice and set aside. In a medium saucepan, combine the sugar, pumpkin, ½ cup of cream and spices. Stir continuously with a rubber spatula or wooden spoon over medium-low heat, about 5 minutes. Transfer to a medium bowl and set the bowl over the ice. Stir to cool. Using an electric hand mixer, whip the remaining cream with the salt, bourbon and vanilla until soft peaks form. Very gently stir into the cooled pumpkin mixture, mixing until the white streaks just disappear. Cover and chill until cold or overnight. Using an electric mixer, whip 1-½ cups of cream, bourbon (if using) and the powdered sugar until soft peaks form. Cover and keep cold. Add 1 tablespoon of grated chocolate to the bottom of four serving bowls. Alternately, layer the pumpkin mousse and whipped cream ending with the whipped cream. Top with piecrust shapes and pecans. Serve chilled. Makes 4 desserts.